The Lipstick Queen herself, Poppy King, decided to create her own line of lipstick for any occasion at the young age of 18. If you’re lippy fan, you already know her work, but she’s outdone herself with the Sinner & Saint Collection. 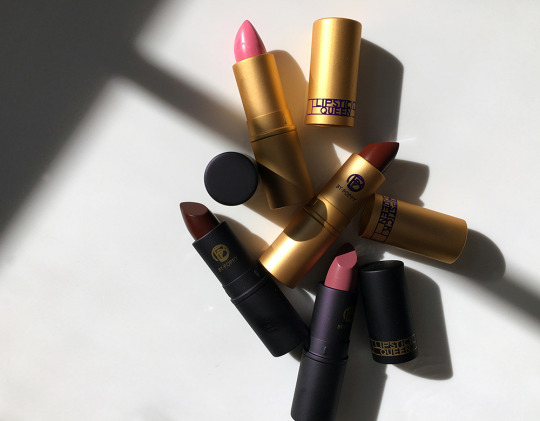 The concept is simple: extremely rich (90%) pigments in the Sinner collection while the Saint Collection is long lasting, moisturizing, sheer lipstick with a hint of color. If you’re clever you’ve already figure out how to use these friends together - yes, lip contouring (so perfect for it). Available in twenty shades, you can pick and choose or buy your favorite shade in both finishes. To contour, simply line the lip with the Sinner, filing in top lip and inner edges of bottom lip, and apply Saint in the center, then blend.